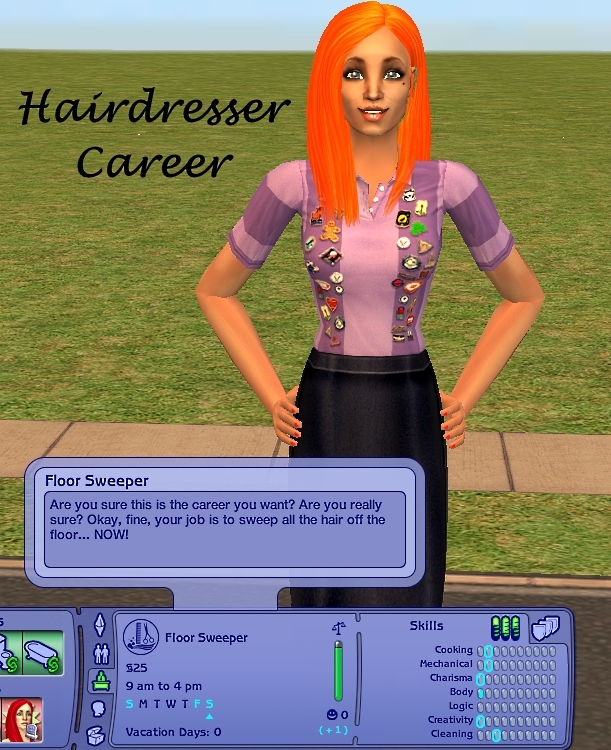 Iâ€™ve decided to make my first career based on my own- A Hairdresser career for Adult Sims. This career is purely based on hairdressing, no cosmetology or beauty as Iâ€™d prefer it to be separate. -This is a demanding job, so make sure your Sim is prepared to work hard! -It can work well for sims with Knowledge, Fortune and Popularity aspirations. Description: Are you sure this is the career you want? Are you really sure? Okay, fine, your job is to sweep all the hair off the floor... NOW! Work Days: Friday, Saturday & Sundays. Skill Requirements: 1 mechanical, 1 cleaning, 1 logic points. Description: You arenâ€™t half bad to be around, plus the clients give you tips. Your job is to wash hair, make tea and occasionally tidy the salon. Skill Requirements: 2 cooking, 2 mechanical, 1 charisma, 1 creativity, 3 cleaning points. Description: Youâ€™ve impressed the Manager, and are training to become a Junior, time to watch and learn from the very best. Work Days: Tuesday, Wednesday & Thursdays. Skill Requirements: 2 charisma, 2 creativity, 2 logic, 4 cleaning points. Description: Youâ€™re now a qualified (junior) Hairdresser! Congrats, but before you get too happy, go get cutting some kiddiesâ€™ hair. Work Days: Saturday & Sundays. Skill Requirements: 3 charisma, 4 creativity, 5 cleaning points. Description: Does your feet hurt? It should be, all these hours cutting, colouring and foiling hair... Itâ€™s all worth it, right? Work Days: Tuesday, Wednesday, Thursday, Friday, Saturday & Sundays. Skill Requirements: 3 body, 6 creativity points. Description: Senior Stylist?! Alright, so youâ€™re getting somewhere now, keep it up otherwise youâ€™ll be at this position forever. Skill Requirements: 4 charisma, 3 logic points. Description: Youâ€™re name has made it onto the price list and any client has to pre-book for you. You can cut, colour and style like no other! Work Days: Tuesday, Wednesday, Thursday, Friday & Saturdays. Skill Requirements: 5 charisma, 7 creativity points. Description: No more taking orders from franchise salons. You now own and manage your own salon, and itâ€™s booming! Donâ€™t let the clients down. Work Days: Tuesday, Wednesday, Thursday & Fridays. Skill Requirements: 6 charisma, 4 mechanical points. Description: One of your clients turns out to be a famous fashion designer and wants you at Fashion Week to style for them. Grab your tool bag and make those models fab! Work Days: Wednesday, Friday, Saturday & Sundays. Skill Requirements: 7 charisma, 8 creativity. Description: Youâ€™ve made it to the top! All the A-Listers come to you for your magic hands, and all the wannabes beg. You are famous, enjoy! Work Days: Wednesday, Friday & Saturdays. Skill Requirements: 10 charisma, 10 creativity, 5 logic points. 1)	(simname) is bored of sweeping the floor. She hides in the bathroom and receives a text message from a friend: â€œHey (simname) ! Party at my house in an hour, wanna come?â€� Does (simname) go to the party? Chance A GOOD: (simname) pulls an amazing sickie and gets away with it! She wins 1 charisma point. Chance A BAD: (simname)â€™s boss isnâ€™t too impressed and can tell she is lying. (simname) loses her tips for the day, -$20 . Chance B GOOD: (simname) leaves the bathroom and continues cleaning the floor. The Manager is happy with her work and awards her with a promotion. Chance B BAD: (simname) does a rubbish job of cleaning and the Manager senses (simname) is not right for this job and fires her. 2)	(simname) is invited out by a co-worker for a quick smoke. She knows smoking is bad, not only that, the salon is really messy. Should she still go with her co-worker? Chance A GOOD: (simname) sneaks back into the salon and thankfully no sees her. (simname) gains 1 creativity point. Chance A BAD: (simname) sneaks back into the salon and gets caught by her manager. Her co-worker blames it on (simname) and lies that she told her to clean. (simname) gets demoted. Chance B GOOD: (simname) stays behind to clean. The manager is very impressed with how spotless the salon is looking and awards (simname) with 2 cleaning points. Chance B BAD: (simname) has finished cleaning the salon. Her co-worker comes back and slyly puts her cigarettes by the basin. The manager finds them and blames (simname), who loses 2 cleaning points. 3)	Whilst watching a senior stylist doing a one length cut, (simname) realises the cut is wonky. Does (simname) tell her superior? Chance A GOOD: (simname) takes her superior aside, and gently tells him itâ€™s a bit longer on one side. Her superior agrees, and didnâ€™t realise, â€œI must need glassesâ€� he jokes. She is promoted. Chance A BAD: (simname) takes her superior aside, and gently tells him itâ€™s a bit longer on one side. He gets offended, and he shoos her away! She loses 1 logic point. Chance B GOOD: (simname) keeps quiet about it and later her superior comes to her and tells her â€œThank you for not mentioning my wonky cut, I must need retraining!â€� She is promoted. Chance B BAD: (simname) is overheard telling one of the other juniors about the wonky cut. Her superior finds out and she loses 1 charisma point. 4) One of the toddlers that (simname) is trimming is behaving really badly. Itâ€™s really getting on her nerves, does she tell the toddler to sit tight and be nice? Chance A GOOD: (simname) calmly tells the toddler to stand still, otherwise her hair wonâ€™t look nice. The toddler smiles and sits still for (simname). She is awarded with 1 charisma point. Chance B GOOD: (simname) continues to allow the toddler to misbehave but thankfully the trim is done, and the toddler is leaving! After all that sweating, (simname) gains 1 body point. Chance B BAD: (simname) continues to allow the toddler to misbehave and it results in her trolley being knocked over, all her tools are all over the salon floor. She loses 2 cleaning points. Chance A GOOD: (simname) replies, I love doing ombrÃ©, itâ€™s chic! Her co-workers nod in agreement. (simname) gains 1 creativity point. Chance A BAD: (simname) replies, I love doing ombrÃ© itâ€™s so simplistic. Her co-workers tell her sheâ€™s boring and soo last year (simname) loses 2 creativity points. Chance B GOOD: (simname)- of course I prefer balayage! Itâ€™s just so au natural. Her co-workers admire her colouring talent and she is awarded with a promotion! Chance B BAD: (simname) of course I prefer balayage! Itâ€™s just so au natural. Her co-workers, tell her that is so last year and sombre is now in. (simname) loses 1 creativity point. 6)	(simname) is doing a set of full head foils. She realises one of the foils has bled and cause a band. Does she quickly correct it? Chance A GOOD: (simname) discreetly weaves through the band and adds a new foil, itâ€™s perfect now! Her client is very happy with the result and gives her a $30 tip. Chance A BAD: (simname) is taking too long correcting the band and her client is getting impatient. â€œI knew I should have not had that burrito for lunchâ€� she thought. She loses -1 body point. Chance B GOOD: (simname) ignores the band and it goes unnoticed by her client. She gains 1 logic point. Chance B BAD: (simname) ignores the band. Her client notices more bands in her hair and gets really upset, (simname) should of checked for more! She loses 2 creativity point. 7)	A celebrity comes in last minute for (simname) to do her hair, but (simname) already has a client booked in. Does (simname) cancel her regular client for the Celeb? Chance A BAD: (simname) cancels her regular client and the Celebrity doesnâ€™t show up, she ends up having no client for that time slot. She loses 1 logic point. Chance B BAD: kindly tells the Celebrity she cannot do her hair as she has a client already booked in but the Celeb has none of it! (simname) is publicly bad mouthed by the Celeb and gets demoted. 8)	A representative of Simella Colours walks into (simname) â€™s salon, offering their new range of ammonia free colours for $500, including all colours, charts etc. Does (simname) buy it? Chance B GOOD: (simname) doesnâ€™t fall for that scam and uses her regular range. She gains 1 logic point. Chance B BAD: (simname) doesnâ€™t buy it and all her clients go the salon down the road for this new Simella range. She loses 1 logic point. 9)	A model is being called to go on the catwalk but (simname) hasnâ€™t finished her hair! Does she let the model go unfinished? Chance A GOOD: (simname) lets the model go to the catwalk, and the critics love the unfinished look! â€œItâ€™s so, so modern and raw!â€� one shouts! She gains 1 creativity point. Chance A BAD: (simname) lets the model go to the catwalk and the critics didnâ€™t like the look. She loses 1 creativity point. Chance B BAD: (simname) rushes about and become frantic! She takes too long and the model misses her turn on the catwalk. She loses 1 creativity point. 10)	A rival Celebrity Hairdresser wants to do a magazine interview with (simname) as a truce, about the life of a hairdresser to Simogue magazine. Does she do the interview? Chance A GOOD: (simname) does the interview with her rival and reads the article the next day. It goes down really well with the readers and she gets more fame! She gains 2 charisma points. Chance A BAD: (simname) does the interview with her rival and reads the article the next day. It turns out the journalist is BFFs with the rival and she completely ruins (simname) in the article. She loses 2 logic points. Chance B GOOD: (simname) doesnâ€™t do the interview and is glad she didnâ€™t! It turns out the journalist hates (simname) for not doing her hair and wanted to ruin her career. She gains 1 logic point. Chance B BAD: (simname) doesnâ€™t do the interview and ends up looking like the bad guy for not agreeing to the truce! She loses 2 charisma points. -Balayage is a colouring technique that is done by hand painting colour or bleach onto the hair, freehanded. -OmbrÃ© is when the ends of the hair is lighter than the roots and upper mid-lengths. -Foils that have bled, are when highlighting foils leak bleach. -Bands are when leaked colour or bleach create a stripe on the hair. 253 people have said thanks to XxCTxX for this download.